A limited number of free accommodations for teachers are available. The priority will be given to EPM Editorial Board members, then to EPM Cooperators and finally to other teachers in order of confirmation of their participation to the Meeting. See here the full articles! EPMagazine CD Collection 2003-2010 (Earlier Version 2). Both EPM Editorial Board Members and other external co-operators and users, are warmly invited right now to send contributions to the mail addresses below in order to be published the next EPMagazine issues. gives you further useful guidelines. 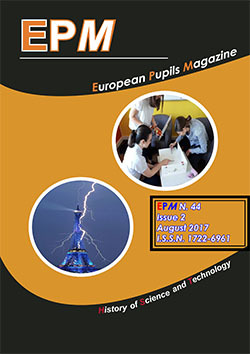 We’d like to remind you that EPMagazine (a scientific-educational periodical) has been available on some web sites for the past nine years so far and its main purpose is to improve the scientific - technological and linguistic skills of growing people by improving their abilities in reading, understanding, talking and writing about Science & Technology. There are several sections: General, 14-16 years old, 17-19 years old, Universities (19 to 24 yrs. old), Green Energy, News and FunPages. The sections 14-16, 17-19 and Universities contain articles written by students attending secondary schools and universities (aging up to 24). The General section is reserved to teachers and adult writers. Green Energy section contains contributions about renewable energy; News section contains news about scientific topics. FunPages section contains games about Science.